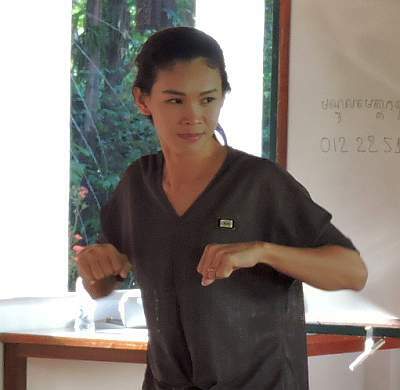 Deaf – Page 14 – Welcome to Cambodia, and…..
Tuesday was the second day of meetings with Johanna Karinen and we discussed the logframe analysis, checking that we included all the activities and had the required indicators for monitoring. Click here. 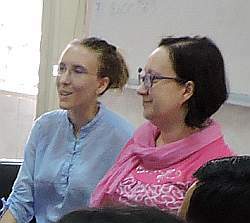 Every year a project coordinator from the Finnish Association of the Deaf comes to Cambodia for a week of Annual Negotiations Meetings (ANM) about the FAD’s funding of the Maryknoll Deaf Development Programme. 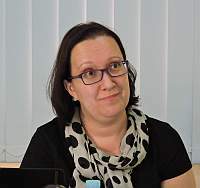 Johanna Karinen, FAD’s representative, arrived yesterday and we began our meetings today. Click here. DDP celebrated International Women’s Day on Sunday rather than on Wednesday of this week in order to make it more accessible to more of the deaf community. The Catholic Church Student Center allowed us to set up our tents in their spacious yard. Click here to see the activities. Technology has really benefited the deaf community. Twenty, thirty years ago, communications among deaf people was either face-to-face or via TTY or TDD machines attached to telephone landlines. Now, with the advent of smartphones and cheaper data service availability, deaf people can communicate more readily, like this young deaf woman signing to her friend on a smartphone Facebook Messenger connection. 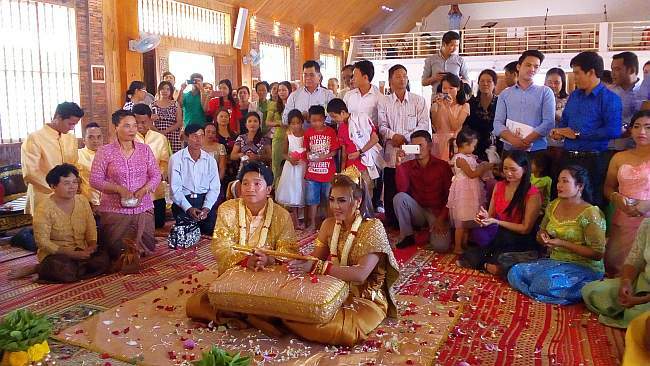 DDP has a young staff and we are always having weddings of the staff, here in Phnom Penh and in the provinces. 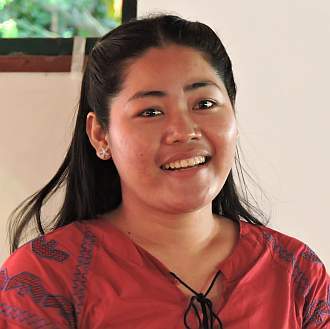 The latest one was Mr. Heng Ravy, our Job Training Project assistant, who married Ms. Roeun Srey March. 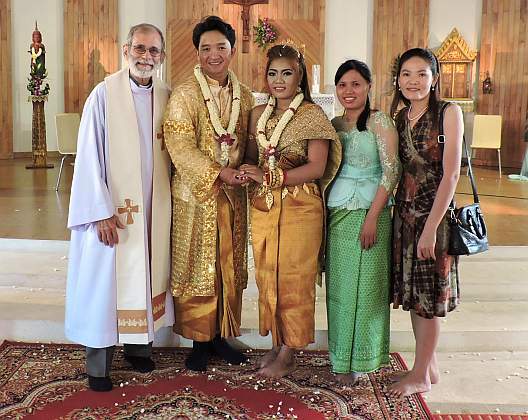 Before the wedding: A Cambodian wedding, even a Catholic wedding, is quite different from a Catholic wedding in the United States. 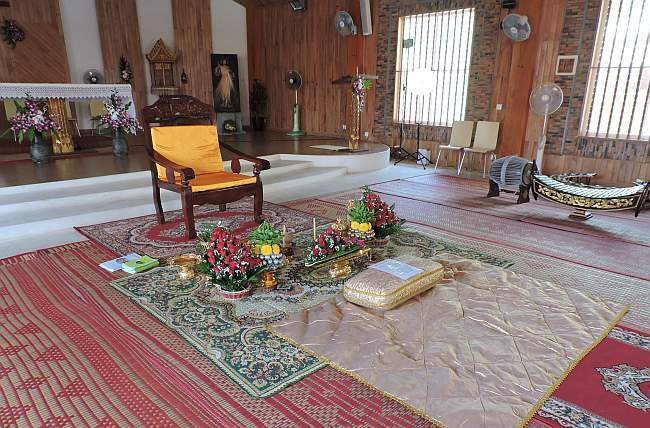 Here is the sanctuary prepared for the ceremony. Before the wedding: No organ for these weddings. 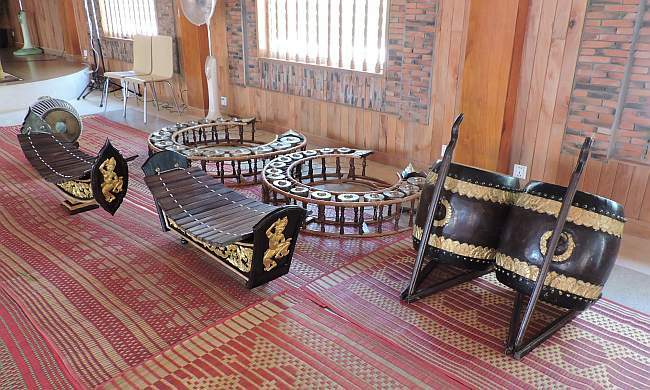 They usually do have an electronic keyboard and guitar but this one also had these traditional percussion instruments to accompany a blessing dance that was part of the event. The ceremony lasted nearly two hours with various cultural additions. Finally when it was over many of the congregation gathered for a group photo with the newly married couple. Ravy the groom is our staff member and afterwards the DDP staff who were present posed with Ravy and Srey March. The two women on the right are the only Catholic members of the DDP staff. The morning was mostly a fun time and then there was the long ride back to Phnom Penh. The bus didn’t get back to the DDP office until 8:15 PM. Click here for the photos. Today was a full day of activities at the Metta Karuna center and then a trip to Angkor Wat and then a quiet evening back at the center. Click here for the pictures. 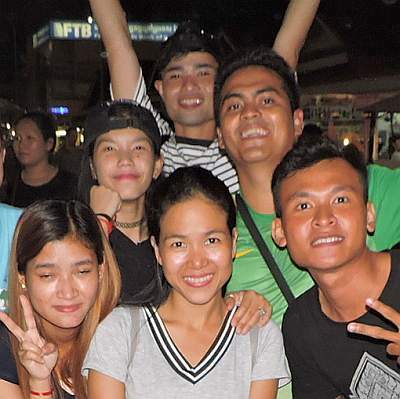 Friday started off early in Phnom Penh. 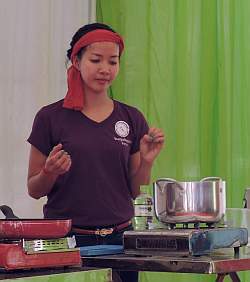 Then after a long bus ride to Siem Reap, the group had lunch and jumped into their camp program. Metta Karuna is a reflection center run by the Jesuits, close to town but away from the noise and hustle of the tourists. Click here to see pictures from the first day. 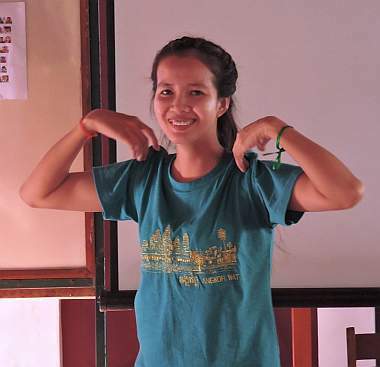 The first DDP Deaf Youth Camp was held 3-5 February at the Metta Karuna Center in Siem Reap. Over the next few days stories and photos from the camp will be posted here. Click here to see the camp main page. 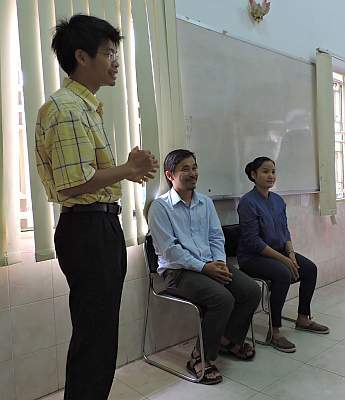 Today we had the third and last of our Education Project graduations, this time at our main office in Phnom Penh. Actually this event centered more on the new incoming class of students who just started their education this week. The deaf students watch the sign language interpreter. The hearing staff watch the speaker on the other side of the room. Keat Sokly, the DDP director, gives some opening remarks. Some of the new students enjoying refreshments after the ceremony. 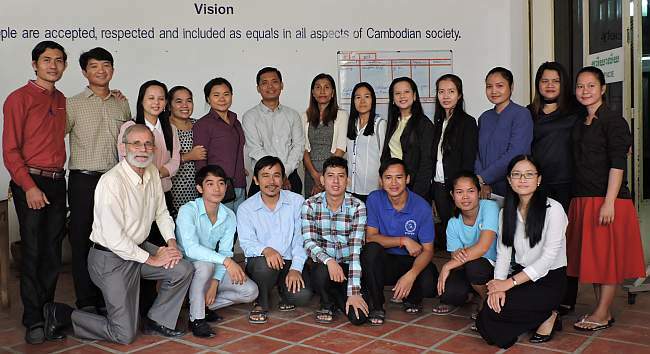 A large number of the hearing and deaf staff who work at the Phnom Penh DDP office.